Just ordered 3m stretch of ikea pax wardrobes 236cm high. Got home and realised the distance between floor and ceiling is not equal all the way across. On one side its 237cm and the other side is 239cm. 0.5cm is due to the floor not being level which i can hopefully sort out with the legs. However the rest is due to the ceiling. What can i do to fill the gap at the top? you build them flat on the floor and lift them upright so the maximum ceiling height is the length of the diagonal from top back to bottom front if you see what I mean. Cancel the order. Good luck with that. Like I said I've put together several of these flat pack Ikea wardrobes. Build it upright isn't an option. The sides/back only become stable when the top is on. I think you can build them upright but it is a 2 man job becuase like you said the back and sides are not stable. 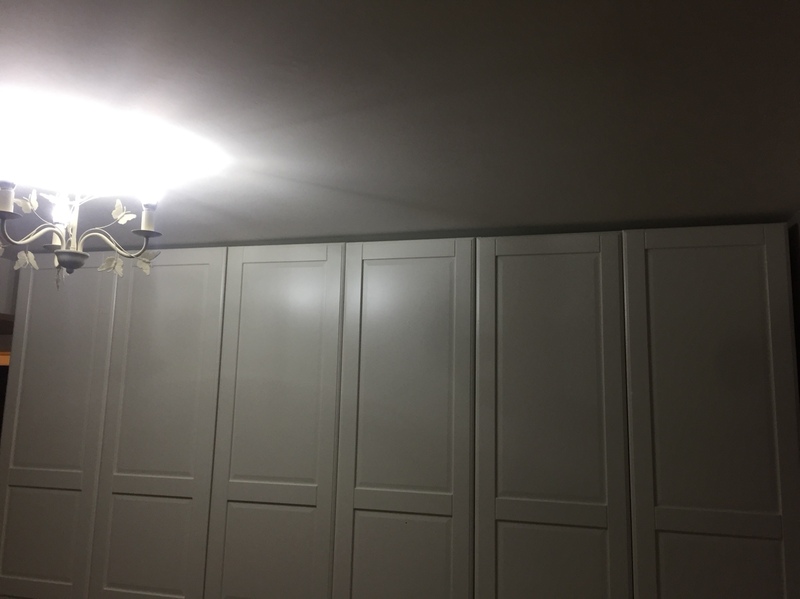 Can anyone help me with my original query about the gap at the top of the wardrobe? Mohammed9706 you crack on then... Once you've got it built come back and I'll try to explain how to scribe in a piece of plasterboard or faced MDF. Though based on your responses so far you won't listen to advice. Thank you. Sorry didnt mean to offend you but ikea staff advised me its possible and based on youtube videos i think i can do it. When you have them up, take some pictures and then we can advise on filling the gap/shimming the wardrobes. I'm with wine-o on this one. There's a high chance they'll be damaged if assembled upright. I always build flat and lift up. Would be easier with a second person but if like me you had a wall nearby that also works well whilst assembling. I have assembled 3 runs of that height in the vertical position. As said, you MUST have a helper to hold the units to stop them racking and damaging the panels. In my case, there wss barely 5mm gap and it filled it with a thin strip of beading. Managed to get the wardrobes up. Definitely a 2 person job making them upright. Please find attached some pictures showing the gap at the top and side that i need help filling? Also the end door which no matter what i try i cant seem to align with the rest?